Micky: --so we're gonna show you two spontaneous, unrehearsed, uh screentests that were done of Mike and Davy before the Monkees-- we started filming-- before we like knew what was all gonna happen. These were two screentests that we did. An' they're black 'n' white so don't worry, the color is OK... (turns to Peter) Whatta you talk so much for? Bob: How'd you get started in show business? How did that all start out? Bob: How did you get started on that? Bob: Did you make any money? Davy: Uh, yeah. But not riding I didn't because you have to serve an apprenticeship for five years. Bob: Hey Davy, jockeys aren't big guys, are they? Davy: No-- Bob: How tall are you anyway? 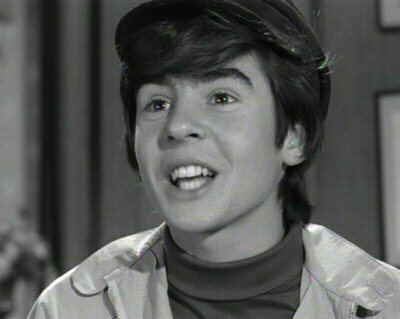 Davy: Uh, fi-- about five-three, yeah. Bob: Do girls like that size? Bert Schneider(?) (off camera): In boots! Bob: Do you ever have trouble adjusting? Bert? : In boots he's five-three. Bob: No I didn't ask you that, Davy. Bob: I asked you whether or not they like you! Bob: You haven't got any hair on your face. Bob: Haven't you got any clean thoughts? You look like such a clean kid! Davy: I am a clean kid. You know, they made me put my hair over my ears and all this schtick-- (he fidgets with hair) I'm really a clean-cut kid, you know. Davy: And ah, they made me do this. Bob: Take off the hat, will ya. I wanna see what the hair looks like. Davy (takes off hat, pats down hair): Doesn't it look great? Bob: What, Davy, lemme ask you - What bag are you in? Bob: What bag are you in? Bob: Alright lemme ask you something-- I mean like, do you make a folk sound or a rock sound or anything like that? Davy: Song and dance I do? Bob: Like cartwheels or something-- Do something quick! Davy: A song and-- You must be joking! Davy: Whaddya want me to do? Sing? Bob: A-- A dance... One of your little quick things. Bob: Hey Davy, you wanna know something? Honestly. Hold it for a second. Bob: I really think you shoulda been a jockey. Bob: Shut the door will ya, Mike? Bob: Shut the door-- Mike sit down somewhere. I wanna ask you a lot of questions about yourself. Bob: Tell us what your name is. Bob: No, I wanna hear the truth. Mike: No that's it man, I'm tellin' ya. It's a pseudonym. Bob: How did you get to Nesmith? 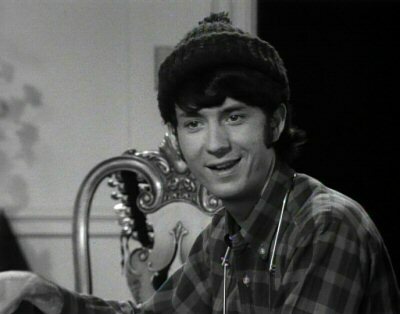 Mike: Well, ah, Nesmith is my real name. Bob: Well, how did you get to Blessing? Bob: How'd you happen to pick Blessing? Mike: Well uh, why're you asking me that? (laughs) It's weird. Get on something else. (laughter off-camera) Makes me very uptight. Bob: Get onto something self-- about yourself. Bob: Tell me the Colonel Mallory story. Mike: No. Ah, because that's a very dumb story. However I will tell you about the time that I was in the Air Force, and I tumped over a general's airplane. : One time, I was in the Air Force. Mike: Yeah that's about the time I was in the general's airplane. Mike (smiles): ...That's it man. That's all the story. Bob: Mike, let me ask you something, seriously now. Why do you do this kind of business? Bob: How'd you get to it? Mike: Why do they call that a light? I don't know-- That's just where it's at. Bob: Well how'd you get to it? How long ago? Mike (laughs to himself, thinking): About two years. Bob: You just came to it two years ago? Bob: What-- what before then? Bob: Yeah, but did you work at that? Bob: Do you think you're a goof? Mike: Well see, it depends on what you think. Bob: Do I think you're a goof? Mike: Well okay, see, then that's where it's at. If you think I'm a goof man, I'm a goof. You know, what I think is what I am, a'right. And I don't think I'm a goof. Bob: I don't think you're a goof. Mike: Right. Okay. I think I'm outta work... (laughter off-camera; Mike looks sideways at camera) ...and I hope I get this series... (more laughter) But a goof? No, I'm not a goof. Bob: Lemme ask you this-- do you have any ego hangups? Bob: Do you have any ego hangups with me right now? Mike (getting up): Yeah listen wait a minute, I mean really, if you're really uptight about me settin' in the chair, babe, I'm sorry but I really wanna see what's in this (opens wardrobe drawer; laughter off-camera) because when I go home I'm gonna say, "Hey, on 'The Farmer's Daughter' (pointing) you know what's in that drawer?" (Bob laughs off camera) That's gonna be a gas. Bob: You may be the only one who's ever been in that drawer, Mike. Bob: Mike, come back here, will ya? Bob: Mike, lemme ask you something. Do you think you can play another part? A part of another guy? Mike: Like what? What is that? What do you want me to be? Strong and silent? Bob: Yeah, be strong and silent. Bob: Okay, Wool-- Woolhat now be a girl. Bob: ...Mike, they're the same thing. Mike: Well, I mean, that's your hangup, man. (laughter off-camera) Not mine, I mean I know where it's at. Bob: Were you ever a strong and silent girl before?